A list makes for fun and easy journaling on any scrapbook layout. Even though it's fun to browse through the patterned paper and embellishments at your local craft store, don't forget that the fundamental components of any layout are photos and scrapbook journaling. Why is journaling such an important part of scrapbooking? Journaling provides an opportunity for the people who look at your album to learn more about you as a person. Without names, dates, and other identifying details, your album will be meaningless to future generations. If you're making a scrapbook for your children, they'll want to know the stories behind photos of their early years. Although many people insist it's best to use your own handwriting when journaling on your scrapbook layouts, don't let poor penmanship keep you from adding your thoughts to a page. If you feel more comfortable with typewritten journaling, try experimenting with free fonts to vary the appearance of your pages. Either way, keep in mind that what you have to say is more important than the journaling method you choose. Write a letter. If you're creating a scrapbook for someone else, write the journaling in the form of an informal letter. Make a timeline. Creating a timeline of events is an easy way to provide important information in a vacation album or family heritage book. Make a list. 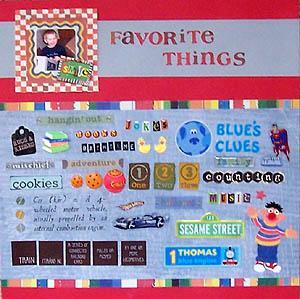 List journaling, such as "10 Things I Love About You" or "Logan's 5 Favorite Toys" is easy for anyone to write. Make a quiz. Ask your subject a series of questions and print the answers directly on your layout. For a personal touch, include the journaling as a handwritten questionnaire. Show the steps in a process. Many family activities, such as cooking Thanksgiving dinner, require extensive preparation. Describe the steps involved. Practice your ABCs. Making an ABC book works well for many different themes. For example, an ABC book of your baby's first year could use the words angel, bottle, and crib to start the layout. Create your own dictionary definition. To add a lighthearted touch to your pages, make a faux dictionary definition. Possibilities include "The Definition of a Big Sister" or "Defining a Miller Family Christmas." If you frequently find yourself working on the journaling for a layout several months after the event has passed, you've probably noticed that it can be difficult to accurately recall all of the relevant details. One easy solution to this problem is to keep a small notebook in your car or purse to use for jotting down journaling ideas. Writing down your thoughts and feelings as an event is happening ensures that you won't be at a loss for words when it's time to create your layout.